LAFAYETTE, La. (Sept. 2, 2014) – LHC Group, Inc. (NASDAQ: LHCG), a national provider of home health, hospice and comprehensive post-acute healthcare services, announced today that it has completed the previously announced asset purchase from Life Care Home Health, Inc. acquiring 13 home health agencies across six states for $10 million in cash. The transaction increases LHC Group’s geographical footprint to 350 locations across 29 states. The transaction is anticipated to be accretive to LHC Group’s 2015 earnings, with a neutral impact expected for 2014. The combined service area of the 13 acquired agencies of Life Care Home Health, which began its home health operations in 1996, includes 44 counties with an estimated 65 and older population of 2 million in the states of Arizona, Colorado, Massachusetts, Tennessee, Utah and Washington. The states of Tennessee and Washington are Certificate of Need (CON) states. The acquired home health agencies produced revenues of approximately $28 million for the trailing twelve months ended in June 2014, with approximately 90% coming from Medicare. Due to a different regulatory process and timeline, the acquisition of an additional Life Care Home Health agency in Rhode Island is expected to close later this year. Life Care Home Health is a sister company of Life Care Centers of America, Inc., which provides nursing home care and long-term health care services for residents in a variety of settings, including skilled nursing homes, assisted living facilities, retirement living communities and home care. 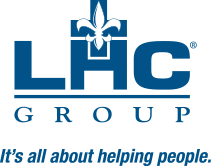 LHC Group, Inc. is a national provider of post-acute healthcare services, providing quality, cost-effective healthcare to patients within the comfort and privacy of their home or place of residence. LHC Group provides a comprehensive array of healthcare services through home health, hospice and community‑based services agencies in its home-based and hospice-based divisions and long-term acute care hospitals in its facility-based division. Certain matters discussed in this press release constitute forward-looking statements within the meaning of the Private Securities Litigation Reform Act of 1995, such as statements about the Company’s future financial performance and the strength of the Company’s operations. Such forward-looking statements may be identified by words such as “continue,” “expect,” and similar expressions. Forward-looking statements involve a number of risks and uncertainties that may cause actual results to differ materially from those expressed or implied by such forward-looking statements, including changes in reimbursement, changes in government regulations, changes in LHC Group’s relationships with referral sources, increased competition for LHC Group’s services, increased competition for joint venture and acquisition candidates, changes in the interpretation of government regulations and other risks set forth in Item 1A. Risk Factors in LHC Group’s Annual Report on Form 10-K for the year ended December 31, 2013, filed with the Securities and Exchange Commission. LHC Group undertakes no obligation to update or revise any forward-looking statements, whether as a result of new information, future events or otherwise.